Our bones and joints give us stability and mobility, the freedom to move and the strength to perform. Young and old, men and women - everyone shares the same dependence on a strong, healthy skeletal structure. It is something we all take for granted. 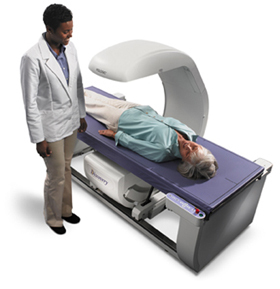 For many years Hologic has set the gold standard in osteoporosis assessment. Osteoporosis is a growing healthcare crisis affecting millions of women and men worldwide. The healthcare costs associated with osteoporosis are staggering, and the effect on your quality of life can be devastating. Fortunately, osteoporosis is detectable and treatable. visualization of calcification in the abdominal aorta that can indicate heart disease, and many other clinical applications. is an important procedure in the evaluation of bone health. The technology uses a dedicated machine designed specifically for this purpose. It is a quick, simple and painless exam that uses x-rays and highly sophisticated software to measure bone loss. BMD is our best defense in the early diagnosis and treatment of osteoporosis. leaving many at risk for broken bones with even a simple fall or bump. Post menopausal women are at highest risk but both men and women lose bone strength as they age. enhanced the treatment of osteoporosis. can have a significant impact on quality of life for osteoporosis patients.